Zionist will tell you that the name Palestine was given to Israel during the British Mandate, so there is no such country as Palestine and no such people as the Palestinians. But wait there is so much more they are not telling you. It is said one fights fire with fire and this analogy applies in this case.In this case we can demolish the Zionist argument with a Jewish reference. 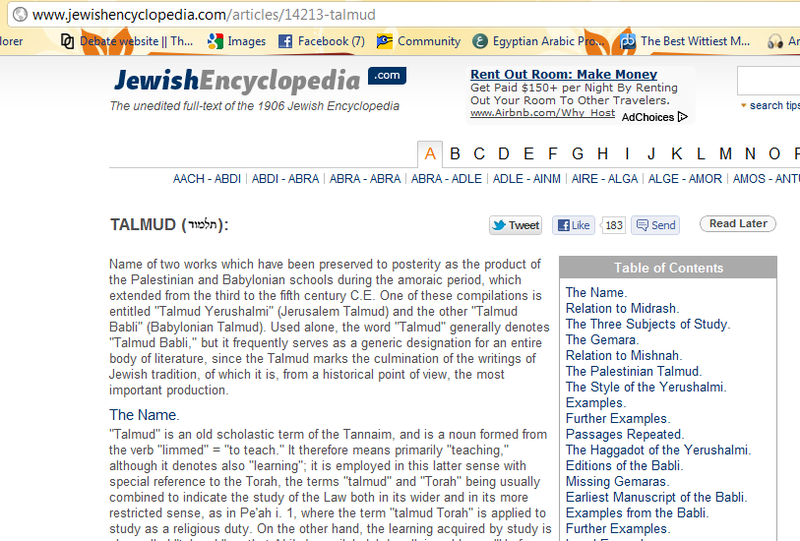 Because how can the Zionist argue against a reference from the “Jewish Encyclopedia” ??? According to the there are to types of Talmud, the Babylonian Talmud and the “Palestinian Talmud”.Yes you read that right the “Palestinian Talmud”. I. Zera’im: Berakot (2a-14d); Pe’ah (15a-21b); Demai (21c-26c); Ki’layim (26d-32d); Shebi’it (33a-39d); Terumot (40a-48b); Ma’aserot (48c-52a); Ma’aser Sheni (52b-58d); Ḥallah (57a-60b); ‘Orlah (60c-63b); Bikkurim (63c-65d). II. Mo’ed: Shabbat (2a-18a); ‘Erubin (18a-26d); Pesaḥim (27a-37d); Yoma (38a-45c); Sheḳalim (45c-51b); Sukkah (51c-55d); Rosh ha-Shanah (56a-59d); Beẓah (59d-63b), Ta’anit (63c-69c); Megillah (69d-75d); Ḥagigah (75d-79d); Mo’ed Ḳaṭan (80a-83d). IV. Neziḳin: Baba Ḳamma (2a-7c); Baba Meẓi’a (7c-12c); Baba Batra (12d-17d); Sanhedrin (17d-30c); Makkot (30d-32b); Shebu’ot (32c-38d); ‘Abodah Zarah (39a-45b); Horayot (45c-48c). In order ii. 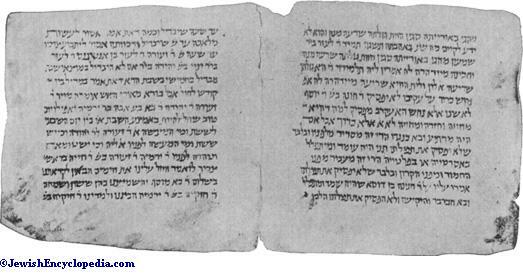 the last four chapters of Shabbat are missing from the Palestinian Talmud, while the treatise Sheḳalim has been incorporated into the editions of the Babylonian Talmud from Yerushalmi, and is found also in a Munich manuscript of Babli. In order iv. the treatises Abot and ‘Eduyot are missing in both Talmudim, and the concluding chapter of Makkot is wanting in Yerushalmi. In order vi. the treatise Niddah ends abruptly after the first lines of ch. iv. Maimonides expressly states in the introduction to his commentary on the Mishnah that in his time Yerushalmi was extant for the entire first five orders (comp. Abraham ibn Daud, ed. Neubauer, “M. J. C.” i. 57); therefore he must have seen the Yerushalmi of the order Ḳodashim, although he himself does not quote it in his commentary on this order (see Frankel, “Mebo,” p. 45b). Except for the treatise Niddah, on the other hand, there was, according to Maimonides (l.c. ), no Yerushalmi for the sixth order. A South-Arabian work of the fifteenth century, however, quotes the Gemara “on ‘Uḳẓin in the Gemara of the people of Jerusalem,” which is said to contain a passage on the zodiac (see Steinschneider, “Catalog der Hebräischen Handschriften der Königlichen Bibliothek zu Berlin,” p. 65, Berlin, 1878). The author of this quotation, therefore, knew Yerushalmi for the last treatise of the sixth order, although it is possible that the passage quoted may have been in the lost portion of the treatise Niddah, and that the name “‘Uḳẓin” may have been used instead of “Ṭohorot.” For further details on the missing sections of Yerushalmi see Frankel, l.c. pp. 45a et seq. ; Weiss, “Dor,” iii. 232; Buber, in Berliner’s “Magazin,” v. 100-105; and Strack, “Einleitung in den Talmud,” pp. 63-65. The mishnaic text on which the Palestinian Talmud is based has been preserved in its entirety in a manuscript belonging to the library of the University of Cambridge, and has been edited by W. H. Lowe (“The Mishnah on Which the Palestinian Talmud Rests,” Cambridge, 1883).